Australia is evolving a rich saxophone culture, with a wealth of virtuoso players and eminent teachers as well as a number of first class quartets currently performing and recording around the country. 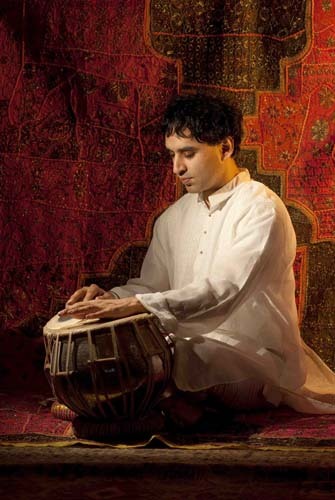 One of the most musically appealing of these is Compass, a jazz-classical unit that boasts an acclaimed Tango recording from a year or two ago and a new CD collaboration with Sydney-based Hindustani musicians on tabla, vocals and sitar. In case you think this obscure, the quartet has crossed over and looped around to bring together several art music and improvisational traditions and pulled off another feat – a sound that is poignant and sensual, tune-laden and imminently listenable in the way it melds tonality and timbre. On Sunday 29th January the saxophone quartet Compass with pianist Jackson Harrison presented a 50-minute set at St Luke’s Hall, Enmore, as part of the 2012 Kinetic Jazz Festival. Jeremy Rose, the creative force behind Compass, is quietly developing in to a composer worth paying attention to – on this occasion Compass premiered his 30-minute suite, Oneirology – the study of dreams for saxophone quartet and piano. Compass opened its Festival set with ‘Passion’ then played ‘Elegance’, pieces from its CD Abrazo Tango. Here the quartet was able to sound like an impressively large bandoneon, just as on its ‘Indian CD’, Ode to an auto rickshaw, it calls to ear an oversized yet subtle harmonium or shruti box. Oneirology followed – a four-movement work cleverly using Inception, Christopher Nolan’s 2010 film on dream invasion, as a point of inspirational reference. In its refusal to go over known or safe territory, Oneirology provided further evidence of the breadth of Rose’s musical imagination. The suite sections were titled ‘Daydream’, ‘Subconscious’, ‘Dream within a dream’, and ‘Déjà vu’, and Rose with his four other players led the audience through stimulating pieces that subtly blended his study of and love for the music of composers Feldman, Wayne Shorter, Scriabin, Debussy, Maria Schneider and Dvorak. Contrasting textures delicate and dense, and sounds tonal and dissonant with shifting colourations, Oneirology is an architecturally sustained and resolved dissertation on dreaming that was expertly rendered by all players. During composed and improvised sections including cadenzas, pianist Jackson Harrison was given scope to impress, and he sparkled on the Stuart & Sons piano. ‘Dream within a dream’ was particularly harrowing, as was the equivalent scene in Nolan’s film (knowing the film is not a prerequisite to appreciating Rose’s work) – atonal clusters contrasted with bell-tone crescendos that called to mind the delicate hybrid scales and textures of Messiaen. Compass succeeds on its combination of strengths, technical and compositional, yet as a saxophone quartet what sets it apart and makes it so listenable is that each player has quite a contrasting approach to tone and articulation. Hence, the quartet is not as thoroughly ‘jazzy’ as SNAP, say, nor as insistently ‘classical’ as Continuum. Rose capitalizes on this in his writing and complements it with a knack for choosing thrilling musical collaborators. Compass is a five star Australian music ensemble that demands to be offered a conservatory or university residency! It deserves a prominent billing at major music festivals, here and abroad. It has much to teach aspiring reed players, composers and improvisers. It models virtuosity, boldness of vision, chamber music delicacy, compositional accessibility, and a savvy interaction with music history and global traditions. Jeremy Rose has discovered how to merge a number of distinct audiences: he creates contemporary Australian music that bridges new and traditional art music, incorporates world cultural streams, and in the case of Oneirology, also makes productive reference to contemporary cinema. Luke Gilmour,Christina Leonard, Jeremy Rose, Matthew Ottignon.